Biography is Tim's debut CD, released in 2007. The CD includes 12 tracks: 11 original compositions and an original arrangement of Karl Jenkins' Palladio, the orchestal score commonly heard in diamond commercials. This is a terrific debut CD. The first four tracks are a terrific Suite. City of Courage is a terrific journey through the emotions of 9/11. I especially like The Dream of You (for his wife) and of course Diamond Music. This CD is on-par with David Lanz and John Tesh. It's amazing that this is his debut CD. I look forward to the next one!!! I was given this CD and his "Christmas" CD. These are both terrific. I really recommend this one; it is good background music but even better listening music. It is intensely emotional and very well done. I especially like Red Rain, The Dream of You, and City of Courage. I recommend this to anyone who likes great piano music. 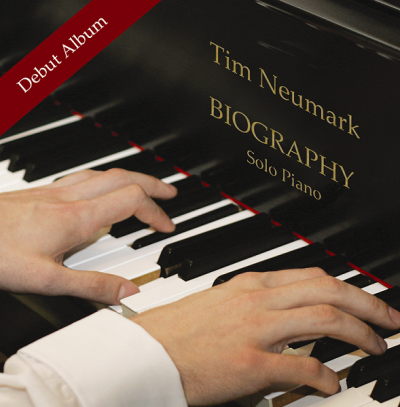 "Biography" is a very impressive debut from pianist/composer Tim Neumark. The twelve mostly original compositions are meditative and emotionally compelling. Themes range from the course of a summer day to the events of 9/11/2001, to prayer and a lullaby. That's quite a variety, but although the pieces are distinctly individual, the tone and pace of the music are consistent enough for a beautiful backdrop for dinner, reading, or just enjoying. Recorded on a Steinway B grand piano, the sound is rich and expressive. The first four tracks are called "Summertime Suite." The composition began during a sleepless night spent at the piano. 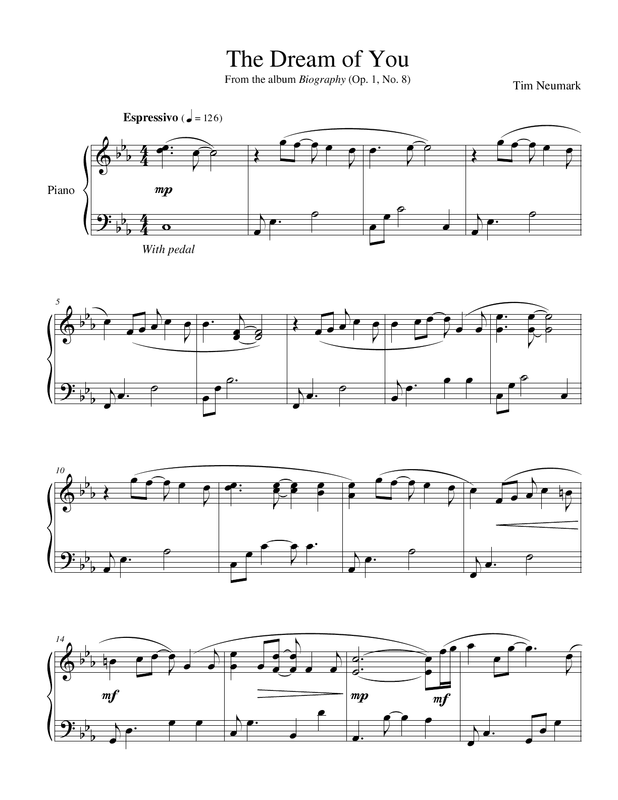 As dawn brought the first glimmer of light onto the piano keys, the inspiration came to compose a piece centered around the passage of time through a summer day. "Dawn" begins very simply and quietly, becoming more melodic as the sun gets brighter and warmer. One of the more carefree pieces on the album, it is full of hope and optimism for a beautiful new day. "Midday" pictures birds resting in their nests in the shade after a busy morning. Smooth, reflective, and very graceful, this piece is a gem. "Dance" was inspired by watching two birds playing in flight, each trying to outdo the other. Upbeat and full of fun, the piece is all about freedom and joy. "Twilight" calms the mood and slows the pace. One of my favorite tracks, Neumark very effectively brings in the deep bass of the piano to add darkness, contrasting with the sparkling treble "stars" and "moonlight." Gorgeous! "Meditation: Quiet Time in a Church" is quite different, in that it is more structured and hymnlike. "City of Courage" is a magnificent piece that was composed to express the overwhelming mix of emotions that erupted on 9/11/2001. It begins as a long melodic ode to the city of New York, and intensifies as the events of the day evolve. The middle theme pictures souls rising to heaven, and is based on the melody to "Heaven's Gate" by Toni Childs. 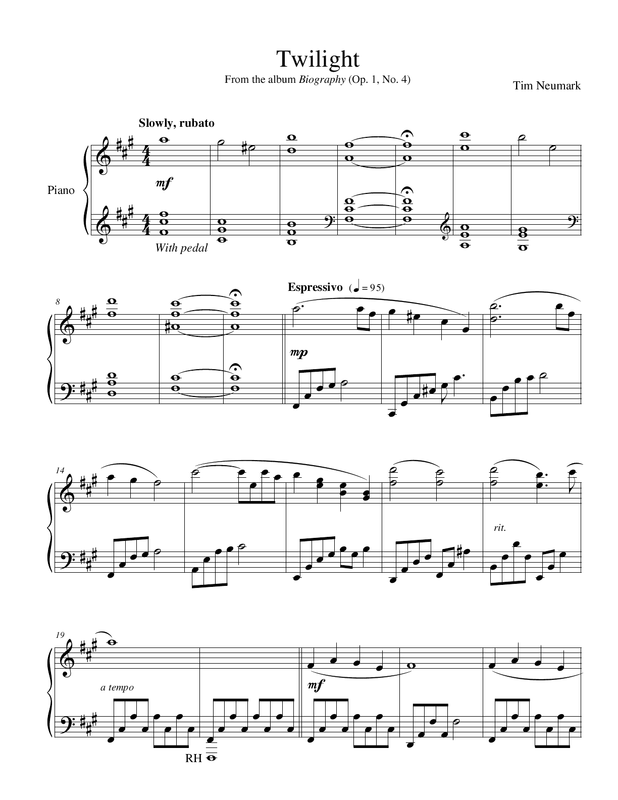 The first theme returns in the third movement, becoming very dark and questioning, reflecting the uncertainty we all felt in the days and weeks that followed. This is an amazing piece. "The Dream of You" follows, full of hope and love, bringing us full circle emotionally. The piano seems to be especially well-suited to depicting rain in all its variety, and Neumark's "Red Rain" is a shining example. The title comes from being at a stop light, feeling directionless, and the stop light turning the rain red. The beginning is very spare and melancholy - gentle raindrops falling on the windshield. The melody builds, sometimes flowing, sometimes gently percussive, always deeply emotional. I really love this piece! 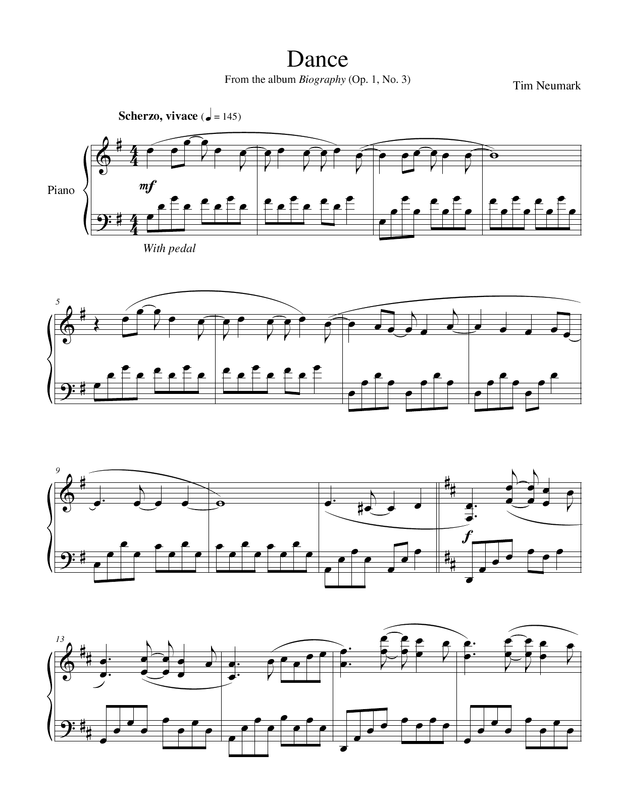 (Sheet music???) In keeping with the biographical theme of the album, Neumark included his first composition, a charming piece called "Beginnings." "Diamond Music" is an arrangement of Karl Jenkins' "Palladio," which has been used extensively in diamond commercials the past few years. Neumark arranged the piece for a friend's wedding, and then played it as a prelude to his own wedding. It's a very effective piano solo. The CD closes with a simple, sincere "Prayer." What a great debut! Tim Neumark is working on a Christmas album for release this year, and I can't wait to hear that one, too. Very highly recommended!